Why hike to Rancheria Falls? If you're a celebrity with an aquaphobic stalker, this trail is sweet relief: you'll never be out of sight of water on this hike - not even when you're puddle-hopping through the tunnel at the beginning of the trail. Best time to visit: In the winter, when the crowds are low, and the spring, when the waterfalls are roaring. Because of its relatively low elevation, the Rancheria Falls trail is not at its best during Yosemite's tourist peak of Memorial Day through Labor Day. Crowd Factor: Higher than you'd expect for a hike in a part of Yosemite that most people have never heard of. The crowd thins out considerably once you pass Wapama Falls, but since there's a hike-in campsite near the bottom of Rancheria Falls, you'll probably never be the only one on the trail. Difficulty: Rancheria Falls rates a 6 or 7 on a scale where Washburn Point scores a 0 and Half Dome is a 10. It's a long hike, and though there's only a mild elevation change from the trailhead to the falls, there's plenty of up and down in between, most of it on the latter half of the hike between Wapama and Rancheria Falls. It's also a rocky trail, and you need to watch where you're going to avoid turning an ankle or wading into poison oak. Scenery Summary: Rancheria Falls isn't a dramatic plunge like Yosemite or Bridalveil Falls, but rather a series of cascades that zip through a narrow canyon for more than a thousand feet (300 meters) of vertical drop before the ride ends in Hetch Hetchy Reservoir. It's possible that none of them alone will take your breath away, but after you've experienced a handful, they'll begin to have a cumulative effect on your happiness - not unlike, say, margaritas. 1. 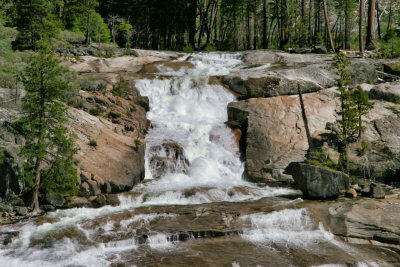 When you pass the sign indicating that the Rancheria Falls campsite is a quarter mile ahead, pull off to the right and you'll spot a cascade about 30 feet (9 meters) high, pictured above, plunging onto a wide sheet of granite. 2. Soon after that, you'll see from the trail an area where the falls spread out in a shallow sheet across an even wider shelf of granite, easily 100 feet (30 meters) across, resembling nothing so much as a giant water slide at an amusement park. 3. Once you reach the campsite, detour through and past it to the river, and you'll see another fall, about 20 feet (6 meters) high, that's been bisected by rock outcroppings into a side-by-side-by-side trio of falls. 4. From the campsite, continue another half mile (0.75 km) or so up the trail, and you'll reach a bridge across the river, with cascades above and below, and a view all the way out to a corner of the reservoir. Nearest Bathrooms: At the parking lot just before the trailhead. Nearest Snacks: There's a restaurant, bar, and snack shop at the Evergreen Lodge in Mather, 8 miles (12.8 km) from the trailhead. Hazards: I've had brushes with a wide variety of potential foes on this hike: poison oak, mosquitoes, ticks, rattlesnakes, and bears. Poison oak is by far the most prevalent of these. You'll find it beside the trail and sometimes on it throughout the hike. During spring runoff or after big storms, water can reach dangerous levels over the Wapama Falls bridge, which you cross en route to Rancheria Falls. Be cautious and heed any warnings the park service has posted, particularly if there's water flowing over the bridge. Some of the smaller streams you pass along the way can also be difficult or dangerous to cross. If you're thinking of staying to catch sunset on the falls and then hiking back in the dark, an important thing to keep in mind - besides the prevalence of bears near the Rancheria Falls campsite - is that the gate to the Hetch Hetchy entrance closes at 9 p.m. in the summer, and if you haven't left by then, you'll be stuck here overnight.